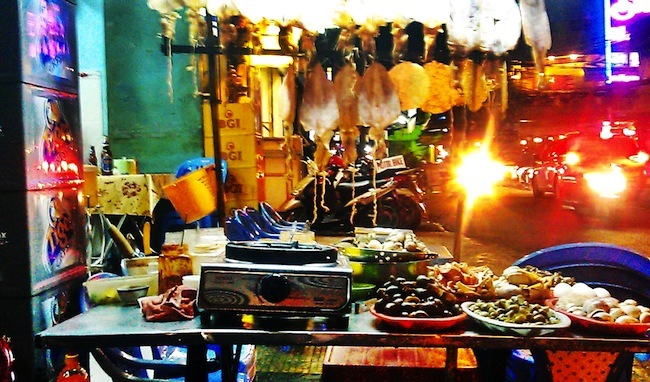 And few street food experiences really capture the soul of a city like eating oc (shellfish) in Ho Chi Minh City, aka Saigon. 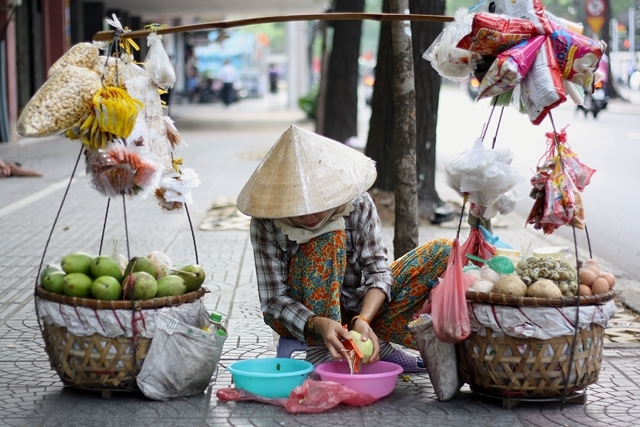 There are oc stalls on virtually every street, and every Saigon resident has their favourite, with a simple invitation to eat oc often sparking heated debate on which stall to visit. And in a city increasingly obsessed with image and conspicuous consumption, oc remains refreshingly class free, with the working classes and the nouveau riche sitting shoulder-to-shoulder guzzling down fresh shellfish – one oc restaurant, Oc Dao on Nguyen Trai St, has even become a hip place to be seen and is popular with many of the city’s TV and music celebrities. Though it may seem intimidating or baffling to foreign visitors, eating oc is actually pretty simple. You simply locate a likely looking oc stall (if you’re travelling with us, ask your guide to take you to their favourite one, or follow the crowds to the enormous, noisy & chaotic Oc Oanh in district 4), find a plastic table, perch your bum on a small plastic stool (not designed for burly westerners but the locals will enjoy watching you try to sit down), and then either order off the menu (if there is one) or wander over to the displays of fresh (usually live) shellfish and point at what you want. Most stalls will at least have clams, blood cockles and a selection of snails; larger stalls will often offer razor clams, mussels, scallops, shrimp, chicken feet and crab claws. The shellfish are usually steamed, grilled or stir-fried with various herbs/spices including garlic, chilli, lemongrass, chives and morning glory, with even tasty chunks of pork fat sometimes added to the mix to really give the dish a flavour boost. 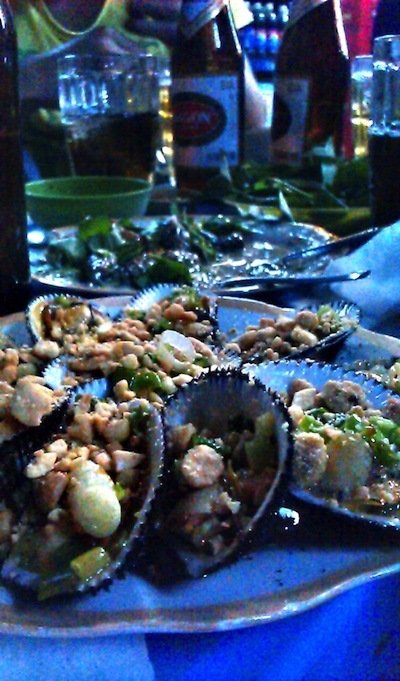 And then you simply sit and guzzle your way through plate after plate of fresh shells, washed down with local beer served the traditional Vietnamese way – over ice. You’ll often get locals asking you to clink glasses (or even “tram phan tram” – down in one) as the oc atmosphere is all about conviviality, friendship and having a good time. And despite the often off-putting appearance, oc stalls are generally very hygienic and only serve the freshest live shells – stalls live & die by their reputation so it’s in their interest to be clean, and I have never, ever been sick after eating oc. So next time you’re in Saigon, make sure you try oc at least once – it’s fresh, it’s healthy, it’s cheap, and most importantly, it’s one of the most enjoyable and authentic experiences you can have in the city. When people ask me what I miss most about living in Vietnam, the answer is always…oc. Tim Russell is Remote Lands' Director of Sales & Marketing for Asia-Pacific, based in our Bangkok office. He arrived in Thailand in September 2012 after a decade living & working in Vietnam.